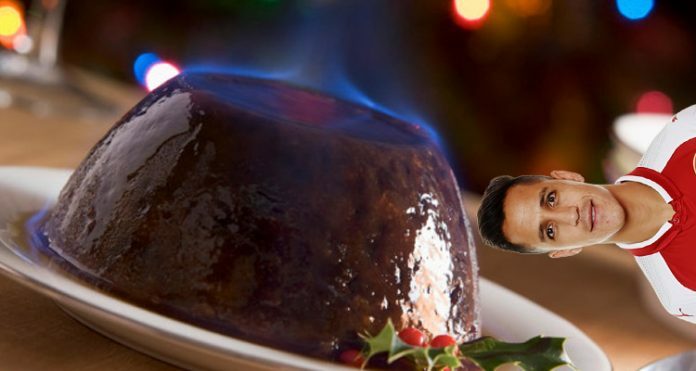 Home Arseblog, the arsenal blog What kind of festive pudding will Arsenal produce? What kind of festive pudding will Arsenal produce? Morning everyone. Yesterday’s Premier League games didn’t do us any favours. Wins for Liverpool, Chelsea and Sp*rs mean that our rivals for the top four have all pulled away from us, although we do have a game in hand. Even Burnley got a bit closer to us with a 2-2 draw with Man Utd that looked like it might even be a better result until a late equaliser got Mourinho’s side a point. His reaction, to say that they need to spend more money, is hilarious really. Poor downtrodden, scratching around down the back of the sofa Jose, who has barely had thruppence-ha’apenny to spend on players since he arrived. Still, he does appear ever closer to losing it like he lost it at Chelsea, and whatever else happens this season a repeat of that would be something we could all get behind. So, Arsene Wenger meets the press this morning ahead of the trip to Crystal Palace tomorrow night. He might well be questioned about fitness issues involving Nacho Monreal who had to come off at half-time during the 3-3 draw with Liverpool last Friday night. He’s been part of the manager’s preferred defensive set-up this season – whether it’s a back four or a back three – but it really feels like something needs to change in there. Laurent Koscielny has looked like a man who needs a break in the last few weeks. He’s been such a stalwart for us at the back, but his last few performances have been error strewn and it’s hard not to wonder if the physical barrier he has to push himself through for every game is having an impact on him. The ongoing Achilles problem, for which he requires daily treatment, must be debilitating and painful, but it could also have an effect psychologically too. Could it be affecting his concentration? He’s played a lot of football in recent weeks, and under normal circumstances you’d be talking about giving him a break. Those normal circumstances I refer to are a team with a defined defensive system and with reliable back-up. At the moment what we do defensively could be described as ‘fluid’ with nobody quite sure if it’s going to be two or three central defenders. It seems as if we have shifted back to Wenger’s preferred set-up – the back four – but even that’s a bit strange as we continue to play a 20 year old, right footed midfielder at left full. Again, I’m at pains to stress that this is no criticism of Ainsley Maitland-Niles, but it’s still an odd decision when you have two experienced international left backs in your squad. Then we have the two young English centre-halves, Calum Chambers and Rob Holding, neither of whom appear to be trusted enough for the Premier League at the moment. It’s a long way from ideal back there at the moment, that’s for sure. Maybe we’ll see the manager shift between the four and the three, but I think he likes some consistency and now that he’s reverted to the former he’ll probably stick with it. It’s now about finding a four that works, and I wish him the very best of luck with that. Up front it seems we’re going to be without Olivier Giroud for around 6 weeks, such is the severity of his hamstring strain. While some might be ok with it from the point of view that it means Wenger will not now have the temptation of starting him, it’s pretty much the worst time to lose him. Lacazette can’t do 90 minutes at Palace, 90 at West Brom then be fresh as a daisy for Chelsea a couple of days later. Giroud, at least, is a reliable option from the bench. His ability to come into a game and score is not one that appears to be matched by any of our other forwards. Walcott remains very much on the fringes, as does Welbeck – even when he’s brought on he’s found it tough going so our relative lack of forward potency is not helped by the Frenchman’s absence. One thing that could offset it, of course, is Alexis Sanchez finding some form again. It would be fair to say that his season until now has been below par, by the standards he’s set since joining in 2014. Is it that he doesn’t care anymore? I don’t believe so. He’s played poorly but I don’t think his character is that of a man who will not try. He just hasn’t been playing well. The reasons for that are open to speculation of course, but I believe it’s a combination of poor form and a player who relies so much on his physical qualities finding that they’re not quite what they were. I think he can turn it around though, and I think if this team is going to come through the next three Premier League games with a respectable points total, we’re going to need to him to do just that. It’ll be our own little Christmas miracle. Anyway, all the news from the manager and his press conference over on Arseblog News this morning. For those wondering about podcasts, James and I will be doing an Arsecast Extra on Friday morning, before he goes off on his travels, so put that in your diary. More from me tomorrow as we preview the Palace game. Next articleAlexis Sanchez- To Sell Or Not To Sell?